High-definition (HD) pocket camcorders, once a rare gadget represented by Kodak’s Zi6 ( ) and Pure Digital’s Flip MinoHD ( ), are becoming more commonplace and starting to stray from the traditional candy bar-style design. One of the most striking and configurable of the diminutive HD camcorders is Sanyo’s Xacti VPC-CG10. The $200 Xacti is a pistol-grip style camcorder that comes in black or pink. With its flip-out 3-inch LCD, extensive system of menus, 5x optical zoom, electronic image stabilization, ability to shoot 10 megapixel stills (with flash, if desired), and exposure, white balance, and focus controls, it appears to have more in common with full-sized camcorders than with such Big Red Button pocket camcorders as the Zi6 and MinoHD. Yet the affordable price, small size, and—most importantly—video quality, tell a different story. And because quality is king, it’s important to point out that if you rely solely on the Xacti’s automatic abilities, you’ll wind up with video that’s often oversaturated outdoors and a little murky when shooting indoors. 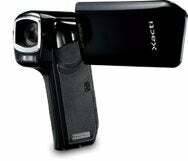 The Xacti is both a still and video camera. The LCD acts as the viewfinder and the controls are arrayed on the back, ready to be thumb-operated. Those controls include a Camera button for taking stills, a Record button for shooting video, a zoom toggle, a four-position joystick for accessing the menu and calling up shortcuts (which I discuss shortly), and a Menu button. The camera includes a flash that functions only when taking stills. You can take still images while shooting video simply by pressing the Camera button and the camera offers a macro mode that allows you to get within centimeters of your subject. At its 10 megapixel settings the camera captures images at a resolution of 3,648-by-2,736. The Xacti runs off an included proprietary Lithium-Ion battery. The battery can be charged only by removing it and inserting it in the included battery charger so you lose the kind of in-camera charging convenience you get with the Flip camcorders. The Xacti stores images and video on an SD card (not included). It can shoot in three modes—30 frames per second (fps) 720p HD, 30 fps standard definition, and 60 fps standard definition. And it captures H.264 video at a data rate of just over 9mbps. On a 16GB card you can store nearly six hours of standard definition video and almost four hours of HD video. You can import video from the camera either by stringing the included USB cable between the camera and a free USB port or remove the SD card and place it in a card reader. Do either and iPhoto opens by default so you can import both the stills and videos. You can attach the camera to a TV via the included composite video cable for standard definition playback or purchase a $25 proprietary component video cable from Sanyo for HD output. The Xacti also includes a lens cap and sports a tripod mount on the bottom of the camera. As I mentioned, by default the Xacti's outdoor video is oversaturated and indoor shooting can be murky. You have a number of ways to attempt to deal with this. As with point-and-shoot still cameras and larger camcorders, the Xacti includes a collection of scene selections, which automatically adjust settings based on the kind of conditions you’re in. The camera includes Full Auto, Sports, Portrait, Landscape, Night Portrait, Snow & Beach, Fireworks, and Lamp. You can also access exposure compensation controls for bumping exposure up or down. And you can adjust ISO and white balance. Doing this can mean diving into the camera’s menu to muck with settings, which largely defeats the purpose of a point-and-shoot camcorder. However, the Xacti includes a Shortcuts feature that lets you assign things like exposure, ISO, exposure compensation, flash, focus, auto-focus lock, and exposure lock to the four-position joystick on the back of the camera. Just push the joystick to the right, for example, and the exposure compensation slider appears, which you then adjust with this same joystick. Nice as it is to have these kinds of controls, they’re not always effective. For example, while you can definitely pump up the brightness by adjusting ISO settings, when you reach into the highest setting (the camera offers ISO 50, 100, 200, and 400) your images display more artifacts. The camera’s image stabilization fails to impress as well. Switch it on and your video gets soft. And this is where the Xacti disappoints. For an inexpensive camcorder it offers a load of promising configuration options. But, in many cases, it doesn’t deliver on those promises. You can tinker with many of those options and not end up with significantly better looking video as a result. Taking all of this into consideration, there’s still the “Yeah, but” factor. While it’s true that there’s a lot of feature sizzle and not all of it produces the kind of results you get from a full-sized camcorder—yeah, but—it’s a $200 camcorder. And true, it doesn’t shoot perfect video out of the box—yeah, but—no pocket camcorder does. They’re all studies in compromise. Of those compromised cameras, I prefer the video that comes from the Flip UltraHD. But it’s a camera that doesn’t shoot stills and doesn’t allow me the option to tinker with its settings if I’m moved to do so. If you’re interested in similar tinkering, want still shooting from a pocketable camcorder, and can rein in your expectations of just what a $200 camcorder can deliver, the Xacti VPC-CG10 is worth considering.